Opening times Wed–Mon 12.30 pm – 9.30 pm. Closed Tue. Food served Mon & Wed–Sun 12.30–10pm. Closed Tue. A no-frills neighbourhood nook serving up generous portions of meat-free pizza and pasta for sit in or takeaway. This 2015 arrival is proving a boon to Edinburgh's veggie diners and a handy option for snacks, takeaway and easy evening meals on the route between the New Town and Stockbridge. 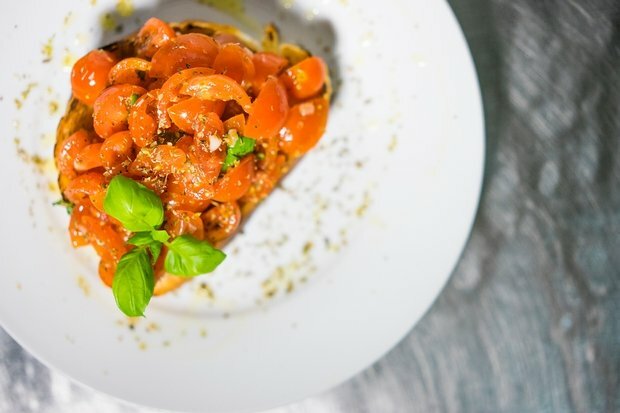 Attractively priced and generously topped pizza is the mainstay, with a handful of pasta dishes, bruschetta and a specials board broadening the choice. Sold in 12-inch rounds or by the slice, with toppings including four cheese with mushroom, Norma (tomato, aubergine and ricotta) or veggie pepperoni, the pizza are properly fired and crispy, while calzoni also arrive puffing steam and just charred on the edges. There's a vegan menu, a wine list limited to a couple of bottled beers and £10 wine and a couple of dessert choices including vegan and gluten-free ice-cream. Décor in the narrow, 20-cover restaurant is off-the-shelf Italian with back-street scenes of old Rome and red-checked tablecloths.